Two years ago I went to the annual Burlesque Hall of Fame conference in Las Vegas for my first time, and had a blast. I wasn’t paying attention last year, when the ticket sales blazed by, and ended up missing it; this year I’ll be back in the saddle for the four days of shows, and after that, if all goes as planned, I’ll be heading out westerly on a road-trip tour with a burlesque company full of friends. Halfway through the Photo Stalk, while I was swapping chips, the little storage case containing my camera’s memory cards slipped out of my gig bag, and most of the walk and all my shots from the prior two days were lost. The moral of this story: aaaaargh. They never did turn up. Tiny little things, memory cards. Not unlike memories. Pictured: Madeline Sinclaire, perched (with permission) in a 1963 Ford Falcon Futura. Title quote from the song Red Red, by the late lost Boston band 21-645. 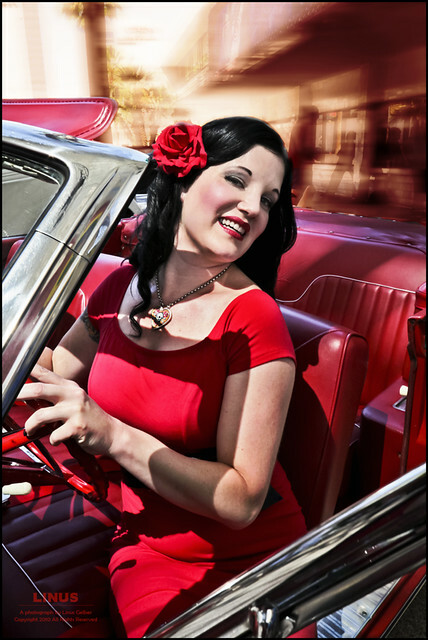 This entry was posted in Big World, General Musings, Picture the Scene and tagged burlesque, Burlesque Hall of Fame, girl, las vegas, Madeline Sinclaire, pin-up, vintage cars. Bookmark the permalink.